NEW YORK--(BUSINESS WIRE)--JetBlue (NASDAQ:JBLU) today announced a variety of events it will support in June as the airline celebrates diversity and equality as part of LGBT Pride Month. JetBlue will also continue its long-standing support for various LGBT groups, events and organizations across the nation throughout the year. JetBlue is once again a proud supporter and the official airline of The Lesbian, Gay, Bisexual & Transgender Community Center – known locally as simply The Center. Since 1983, The Center has been supporting, fostering and celebrating the LGBT community of New York City and empowers people to lead healthy, successful lives. The Center celebrates diversity and advocates for justice and opportunity. During Pride Month, JetBlue will proudly support The Center’s Garden Party, a kick-off event for New York City’s Pride Week celebrations, as well as The Center’s Family Pride Picnic, a celebration for children of LGBT parents and a joyful opportunity to celebrate families of all backgrounds. "The Center's doors are open 365 days a year to welcome over 6,000 people a week looking for support, community and connection,” said Glennda Testone, executive director, The Center. “With help from partners like JetBlue, we're able to present joyous Pride celebrations like The Center's Garden Party and Kidding Around Family Pride Picnic that affirm and support our community not just in June, but all year long." In April, JetBlue also supported the annual Center Dinner, which raises critical funds to support an array of crucial Center programs. Over the years, the Center Dinner has served as an occasion to recognize members of the LGBT community, organizations and allies for their work and commitment to achieve equality for all. For the second year in a row, JetBlue is also a proud supporter of The Stonewall Inn Give Back Initiative (SIGBI), which leverages the historic significance of the New York City LGBT landmark to help other communities that don’t have the same LGBT resources or support. JetBlue was an original SIGBI donor when the nonprofit was formed in 2017. This year SIGBI will announce their new non-profit beneficiary for 2018, Matria, an LGBT non-profit in Puerto Rico. As the #1 airline in Puerto Rico with more service than any other carrier and nearly 500 local crewmembers who call the island home, JetBlue is proud to stand with SIGBI in supporting the LGBT community on the island. "We are excited to once again partner with JetBlue to support our nonprofit The Stonewall Inn Gives Back Initiative. The Initiative supports grass roots organizations scattered across the country and especially those in places where equality has been slow to arrive," said Stacy Lentz, Co-owner of the Stonewall Inn and CEO of the Stonewall Inn Gives Back Initiative. "With JetBlue's generous support the initiative is able to do the much needed work of helping some of the most underserved LGBTQ communities." JetBlue is also calling on Stonewall Inn patrons to help celebrate for a good cause this month. On June 28, The First Annual Stonewall Inn Pride Day and anniversary of the historic 1969 demonstrations, JetBlue will match every dollar spent on drinks by customers at the Stonewall Inn with a donation directly to SIGBI. 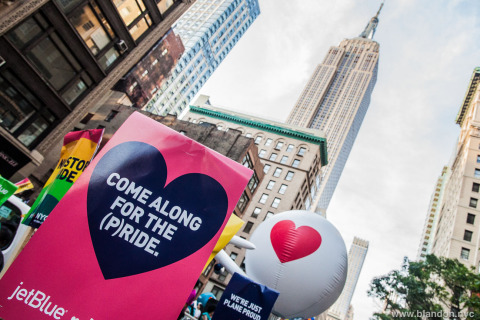 JetBlue proudly continues to support the New York City Gay Men’s Chorus (NYCGMC) for another year and is pleased to join them in this month’s New York City Pride March. Founded in 1980, NYCGMC has formed a strong bond with devoted followers and continues to make lasting connections with new and diverse audiences. NYCGMC is comprised of more than 260 talented singers of various ages, backgrounds and experiences, and is a full member of the Gay and Lesbian Association of Choruses, Inc. (GALA), the world’s only association committed to serving the LGBT choral movement. JetBlue’s support of the LGBT community also reaches beyond New York City. Over the years hundreds of JetBlue crewmembers and senior leaders have marched in pride celebrations across the country including in the airline’s focus cities of Boston; Long Beach, Calif.; New York; and Orlando, Fla.
JetBlue also regularly takes part in Provincetown Carnival, will be supporting The Wilton Manors Stonewall Pride Parade & Festival in Fort Lauderdale for a second year and, for the first time in 2018, is a proud sponsor of Greater Palm Springs Pride. 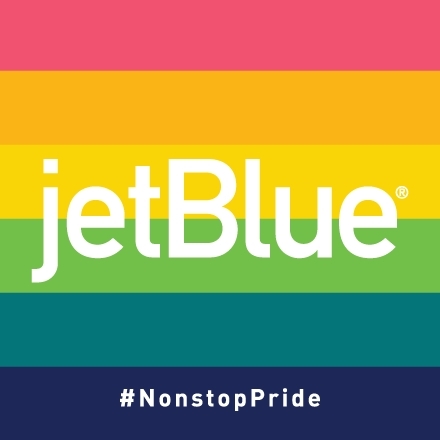 Additionally, JetBlue has provided support for a variety of LGBT nonprofits across the country including Boston Gay Men’s Chorus, Lambda Legal, New York City Anti-Violence Project, NLGJA – the Association of LGBT Journalists, OutRight Action International, the Trevor Project, the Provincetown Business Guild and, new for 2018, is a proud founding member of the Massachusetts LGBT Chamber of Commerce. For six years JetBlue has received the top score of 100 on the Corporate Equality Index (CEI). The honor from the Human Rights Campaign Foundation is based on surveys and reports on corporate policies and practices related to LGBT workplace equality. The CEI evaluates LGBT-related policies and practices including non-discrimination workplace protections, domestic partner benefits, transgender-inclusive health care benefits, competency programs, and public engagement with the LGBT community. JetBlue's efforts in satisfying all of the CEI's criteria results in a 100 ranking and the designation as a Best Place to Work for LGBT Equality. JetPride became JetBlue’s first Crewmember Resource Group in 2012, welcome to all LGBT crewmembers and their allies. JetPride strives to provide mentoring to develop their career paths, support external JetBlue initiatives in the LGBT community, bring increased visibility to and perspective on LGBT workplace issues, and advocate for a continued bias-free workplace where LGBT JetBlue crewmembers can thrive.